What are the most important issues for tribals in your region? Economic development, unemployment, agriculture, poor roads, irrigation, education and health and electricity. When did these issues become so important? There is not too much difference in the issues that were important earlier and the ones that are important today. Perhaps health was a bigger issue earlier than education, while now education has become more important. Earlier people used to ask for hospitals, now they ask for schools. Development. I meet the people and I hear their problems. People trust me and believe that I will still support their cause even after I am elected. Who were the leaders that inspired you? I was employed in Bharat Heavy Electricals Ltd as assistant foreman. My area was a Congress dominated area and a constituency reserved for ST. I joined the BJP as there was a concern that people of my community should not become Christian. I came in touch with the Vishwa Hindu Parishad. We were helped by sadhus. We used to try to get converted tribals back to the Hindu fold. I want improvements in communications infrastructure, irrigation, education and healthcare. I want to do in five years all that hasn't been done in 50 years. We don't like to live away from the lap of nature. As for the economic value of the ecology in our lives, this has got disrupted because there is a flaw in our planning. We don't give enough importance to what people want. What is planned in Delhi is Delhi's plan. What the tribal wants hasn't been understood by many people. The present government has tried to understand it, and has understood much more than the previous governments. Another reason why the stress on the environment is increasing is due to the rise in population. 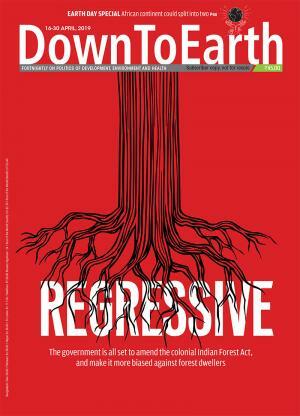 Is there sufficient legal protection for tribal people? No, the legal protections are not sufficient. There is a need for more legal protection. Whatever protection is already provided is not implemented properly. The reason is the attitude of the officials responsible for implementation. What is needed is a change in the attitude of officials. The spread of Naxalites is a result of this. Why is the visibility of tribal leaders so low in India? That's right. But this is changing. The BJP is definitely keen on promoting tribal leaders and there have always been tribal office bearers in the party. Which is why the party has gained support in tribal areas in an unprecedented way. There are four tribal ministers with a cabinet rank in India. Who could have imagined that coal could be put under a tribal? The BJP has put Kariya Munda there. The tribal national leadership is not as vocal as the Scheduled Caste leadership. Dalits live in cities and villages. In cities, it is easy to raise an issue and be noticed because there is a communications infrastructure. Tribals live in the forest. That's why the government created a separate ministry for tribal affairs. Why do tribal leaders know so little about other tribal areas? It isn't that they know nothing. But it is inherent in tribal behaviour that they are content with little. As they are so innately linked to their world, tribals tend not to be bothered about the world beyond the immediate. But this is improving with the growth of the communications infrastructure. Why don't the Tribes Advisory Councils meet often enough? Parliamentarians are not even aware of the TAC. A lot depends on the chief minister, who is the chairperson. We send directions from our ministry that the council's meetings should be held regularly. A lot is said about upliftment of tribals. What can the country learn from them? If this country is to be saved, it will be the tribals who will save it. Tribal societies are free of a lot of social evils. Tribals are more humanistic. They are not exploitative by nature and they adhere to the basic human values in a way that modern society has forgotten. There is a lot that the world can learn from tribal people.